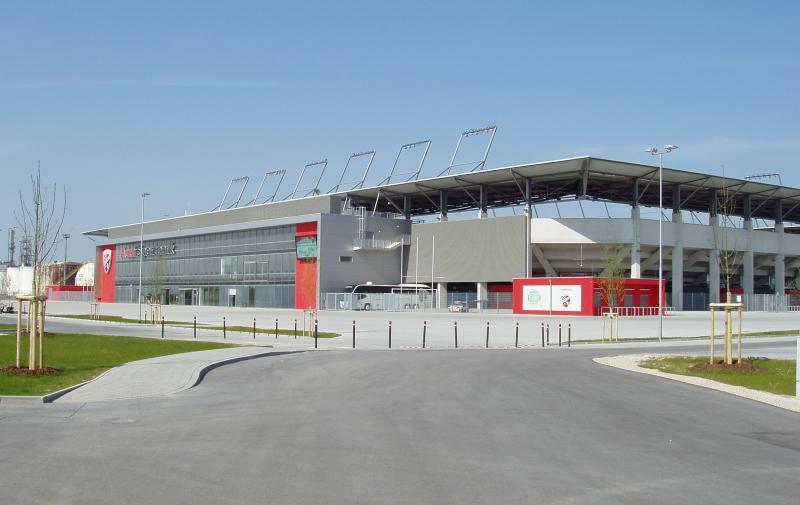 Audi Sportpark was built to provide newly formed merger club FC Ingolstadt with a new and modern home. The stadium got built at the terrains of the Bayernoil refineries on the south-eastern edge of the city. It came at a cost of about €20 million, which was completely paid for by the club and their main sponsor Audi. Audi Sportpark officially opened on the 24th of July 2010 with a three-team tournament involving Ingolstadt, Wolfsburg, and Augsburg. The stadium counts with a total of 1,350 business seats and 18 VIP lodges. It can furthermore be easily expanded to a capacity of 30,000. Audi Sportpark is located on the south-eastern edge of the city of Ingolstadt, about 5.5 kilometres from its historic centre and about 4 kilometres from its main rail station, which lies toward the south of the city. There is regular train service from Munich and Nuremberg to Ingolstadt. The journey from Munich takes 45 to 60 minutes, whereas the ride from Nuremberg takes no more than half an hour. There is no direct public transport connection from Ingolstadt’s main rail station (Hauptbahnhof) and it may therefore be better to catch a train that stops at station Ingolstadt Nord (less frequent trains, but located closer to the historic centre). From the central bus terminal (ZOB), which is located on the northern edge of the historic centre and a short walk away from Ingolstadt Nord, you can catch bus 51 to the stadium. Take the bus in the direction of Audi-Sportpark, which is also the last stop on the line. From the historic centre (Stadttheater) you can also take bus 21. Again, take the bus toward Audi-Sportpark and get off at the final stop. Both buses run at least every half an hour. The ride takes about 15 minutes. On matchdays there is a shuttle service (line 202) that starts at ZOB and goes through the historic centre to the stadium. Buses run every 15 minutes from two hours before kickoff. If coming from the main rail station, it is best to first take a bus to the centre and then follow as above. Audi Sportpark is located on a business park on the edge of the city. There is a nearby retail park with some fast food options if you need something to eat, but overall it is an unattractive area and eating and drinking is better done in Ingolstadt’s city centre. There are no hotels directly near the stadium, but Auwald Hotel and Art Hotel Ingolstadt are both good options at about half an hour walking away from the stadium. There are a few more hotels in the centre of Ingolstadt, but most will decide to travel in and out for the match and stay in Munich or Nuremberg. 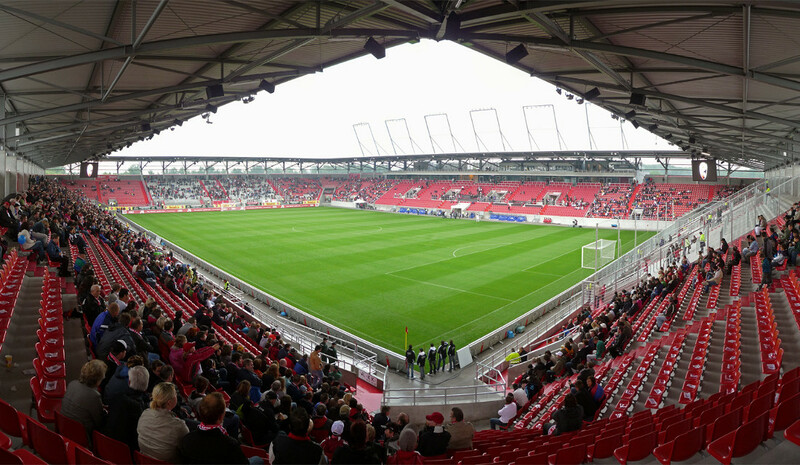 Tickets for Ingolstadt games can be bought online, at the Fan and Ticketshop at the Audi Sportpark, at the Fan and Ticketshop at the Moritzstraße 13 in Ingolstadt’s historic centre, or at one of the sales points in the Ingolstadt area. Tickets can also be bought at the gates of the stadium on the day of the match. Ingolstadt don’t normally sell out in the 2. Bundesliga save for the odd high-profile match. Ticket prices range from €22.00 for a seat in one of the corners to €28.00 for a seat at the long side opposite the main stand. A ticket for one of the standing areas costs €12.00. Tickets are up to €6.00 more expensive if bought on the day. For more information call +49 (0) 841 88 557 155, or email ticketing@fcingolstadt.de. Audi Sportpark offers guided stadium tours that include the press areas, dressing rooms, players tunnel, and business sections. The tours last about 60 minutes. Tours typically run on Tuesdays and Wednesdays at 10:00am or 3:00pm. Check the website of Audi Sportpark for current dates and times. The tour costs €8.00. Fcingolstadt.de – Official website of FC Ingolstadt 04. Audisportpark.de – Official website of Audi Sportpark. Ingolstadt-turismus.de – Official tourism portal for Ingolstadt. Invg.de – Ingolstadt public transport information.